(Bakersfield, CA) – Valley Children’s new outpatient center in Bakersfield was recently recognized by the Associated Builders and Contractors Northern California chapter as a 2018 Local Excellence in Construction Award Winner project. Quiring General, LLC, accepted the award as the developer of the project. 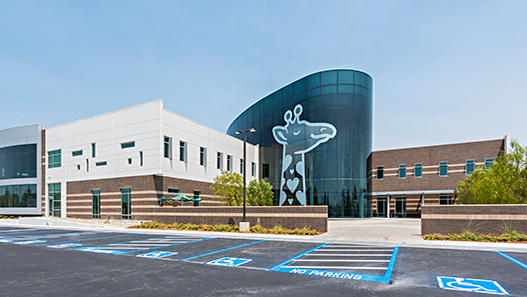 Eagle Oaks Specialty Care Center, which opened in October 2018 in southwest Bakersfield, is a 52,000-square-foot, state-of-the-art medical center designed for children, to serve the pediatric subspecialty needs of Kern County families. The facility includes a playground, gardens, a 50-foot-tall glass wall in the atrium and interactive video areas. “Eagle Oaks is the culmination of decades of commitment to children in this region. This entire complex is designed for kids, to help them heal and to keep them closer to home,” said Todd Suntrapak, President and CEO of Valley Children’s Healthcare. Currently, Eagle Oaks offers services in 10 pediatric specialties: Cardiology, Endocrinology, Gastroenterology, Hematology, Infectious Disease, Nephrology, Orthopaedics, Otolaryngology (ENT), Pediatric Surgery, Plastic Surgery and Urology. Over time, Valley Children’s will add: Genetics, Neurology, Neurosurgery, Pulmonology and Rheumatology/Immunology. Learn more about Eagle Oaks Specialty Care Center here.